Succulents, with their interesting shapes and colors, have become increasingly popular in the landscape. 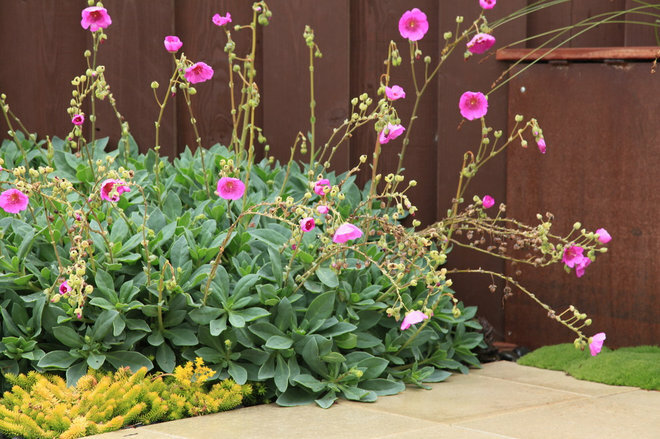 While larger succulents are often used singly as accent or container plants, smaller succulents are getting a second look for use as ground covers. As with other succulents, they are attractive, drought-tolerant and low-maintenance. Here are 8 low-growing succulents for you to try in your garden. It’s important to note that all plants profiled below require well-drained soil and, in many cases, some supplemental watering. The amount and frequency of watering depend on several variables, including exposure, temperature and soil. A good rule of thumb is to water 8 inches deep and then allow the soil to dry out before watering again. Succulents need more water in spring, when they are actively growing, and very little in winter. Gray-green leaves form a dense mound that is transformed by the appearance of magenta flowers spring through fall. The flowers are about 2 inches wide and last one day, with new ones ready to take their place the following day. For an eye-catching combination, pair rock purslane with pig’s ear (Cotyledon orbiculata), a succulent that produces orange flowers. Rock purslane does best in Mediterranean climates but is suitable as a container plant and can be treated as an annual in colder climates. Succulents aren’t just for warm climates. This creeping ground cover can grow in zones 3 to 8. The beauty of this species of stonecrop lies in its tightly whorled leaves, which are often tinged in red. In late spring and summer, star-shaped pink flowers blanket the leaves and attract butterflies. S. spurium ‘Red Carpet’ grows in the foreground of this photo, with blue-gray S. reflexum ‘Blue Spruce’ in the background. 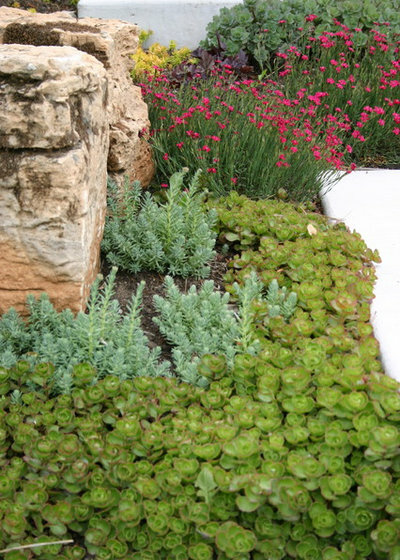 The lovely blue-gray and upright 1-inch leaves gradually spread to create an attractive ground cover in frost-free areas. The flowers range from white to chartreuse and appear in summer. Blue chalksticks is ideal for creating color contrast when used next to plants with bright green foliage, such as kangaroo paw (Anigozanthos spp.). It’s a good choice for areas with mild Mediterranean climates. 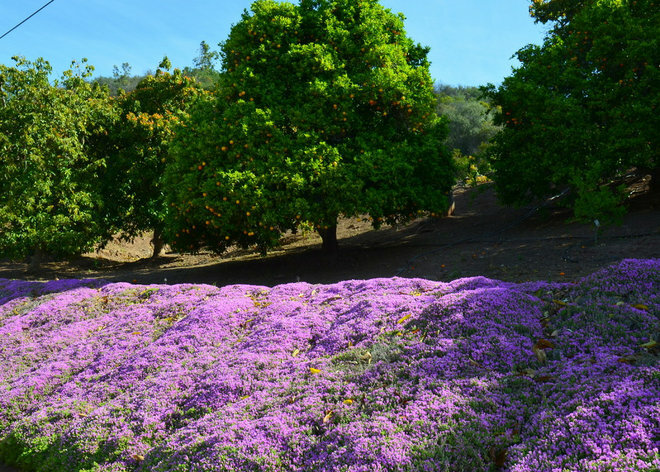 In addition to making a great ground cover, this beauty is often used for erosion control, in containers and as a fire-wise plant. Here, blue chalksticks grow between Furcraea macdougalii in the background and ‘Elijah Blue’ blue fescue (Festuca glauca ‘Elijah Blue’) in the foreground. 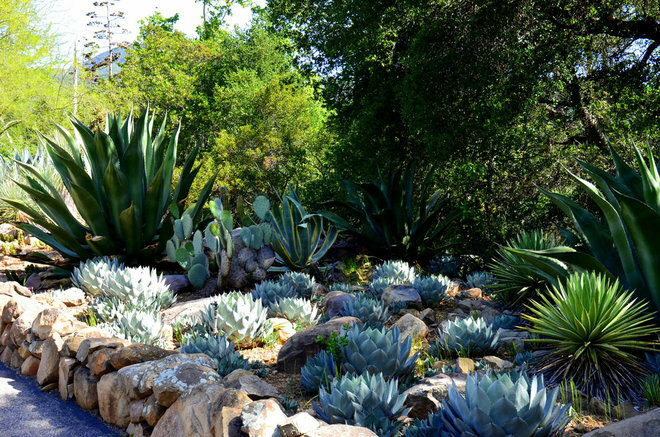 Small- to medium-size agave species are unconventional ground cover choices that are becoming more popular. 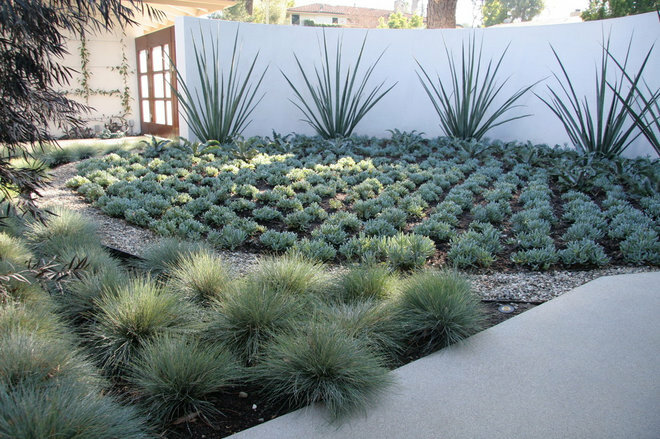 For example, Parry’s agave, with its very attractive rosette pattern, makes a wonderful water-wise ground cover. Use it next to boulders for great texture contrast. This plant and other smaller agave species work well in arid climates, including low-desert climates, since they can handle the full sun and intense summer heat that may cause succulents better suited for mild Mediterranean climates to struggle. In this photo, A. parryi var. truncata grows among larger species of agave. Square light-green stems arranged in clumps give this African native the appearance of a cactus. The sides of the stems are covered in brown spines. Older specimens can grow quite large and look at home next to columnar cactuses. 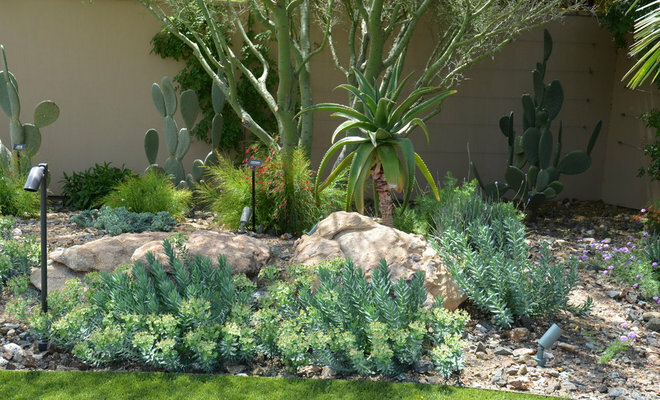 Smaller ones look great next to boulders and drought-tolerant perennials such as desert marigold (Baileya multiradiata) and blackfoot daisy (Melampodium leucanthum). 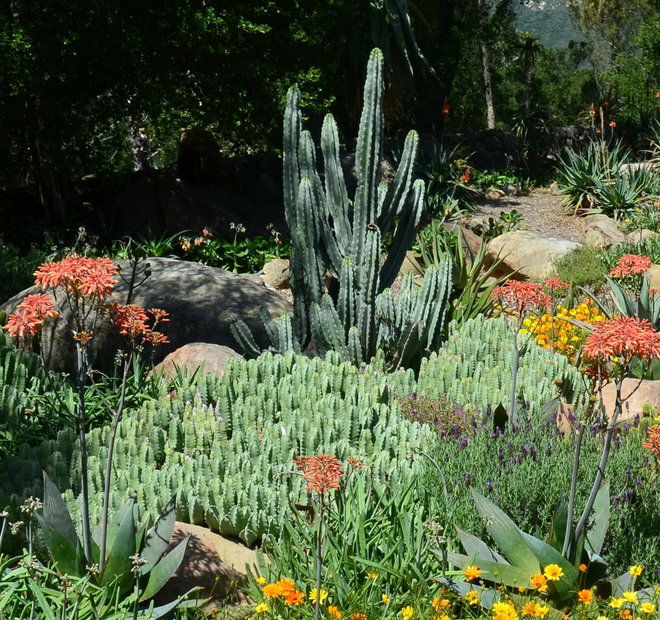 Here, resin spurge surrounds a Peruvian apple cactus (Cereus repandus), along with soap aloe (Aloe maculata) and its colorful flowers. Caution: The milky sap is toxic. Vibrant flowers in shades of pink, purple and red, depending on the variety, create a colorful carpet in late spring into summer, almost completely covering the foliage. When this succulent with purple flowers is not in flower, the narrow gray-green leaves add a visually cooling element to the garden. Royal dewflower roots when it comes into contact with bare soil, helping it to spread up to 3 feet wide. Although its low growth habit may lure you to walk on it, avoid the temptation since it doesn’t tolerate foot traffic. If you’re looking for a succulent with purple flowers, this is it! Here, D. speciosum ‘Rosea’ covers a gentle slope. Narrow, waxy stems, with an upright growth habit, add another dimension to the landscape. Rather than spreading outward close to the ground, new stems are produced along the outer part of the plant, gradually increasing its width while still growing upright. Tiny pale pink flowers bloom along the upper half of the stems in spring. Small leaves may appear and are soon shed. 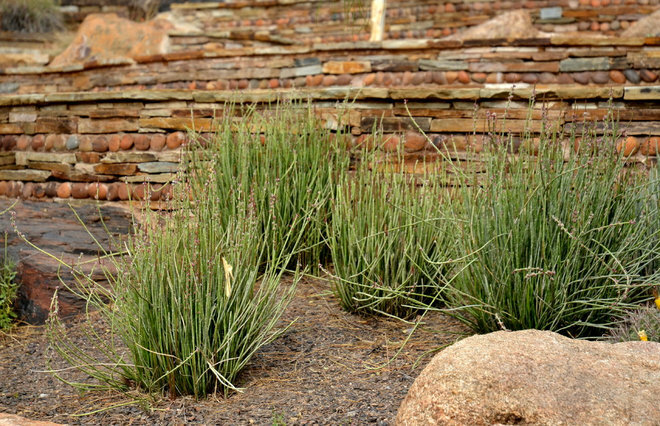 Create a visually appealing design by planting candelilla in staggered rows.